I don't like ad-bikes that take up proper parking spaces or get in the way, but I've no problem otherwise. 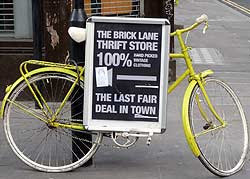 Like this lemon-yellow one, in Brick Lane this afternoon, advertising the Thrift Store. But you know how if you see a van with 'shopfitters' on the side, you see it as 'shoplifters'? Well, given the reputation of the market here for flogging stolen bikes, you can't help reading it as Brick Lane Theft Store. Tis a pretty looking yellow bike...mmm...would go nicely with a dress during summer. Cannot wait for better weather. I always see 'shopfitters' as 'shoplifters'!